***DISCLAIMER*** The following review is entirely my opinion. If you comment (which I encourage you to do) be respectful. If you don't agree with my opinion (or other commenters), that's fine. To each their own. These reviews are not meant to be statements of facts or endorsements, I am just sharing my opinions and my perspective when watching the film and is not meant to reflect how these films should be viewed. Finally, the reviews are given on a scale of 0-5. 0, of course, being unwatchable. 1, being terrible. 2, being not great. 3, being okay. 4, being great and 5, being epic! And if you enjoy these reviews feel free to share them and follow the blog or follow me on Twitter (@RevRonster) for links to my reviews and the occasional live-Tweet session of the movie I'm watching! The song in this film is a country song! Get it? Because country music is just horrendous. I often sing the praises of horror films that are produced overseas and will make the claim that they are better than what America produces. As critical as I am of the genre, I watch a lot of horror films and find 95% of them to be awful and filled with low production value and little to no scares and it seems like every one I watch that is made outside of The States is impeccable and unique. However, I’m forgetting that I’m just watching the popular ones from elsewhere and not realizing that these countries also have their fair share of crap in this genre. For example, this Japanese film called The Suicide Song. This movie was an eye-opener to how bad foreign horror features can get. At an all-girls school, student Anzu Natsuno (Yuko Oshima) witnesses a classmate kill herself after singing a melodramatic song. 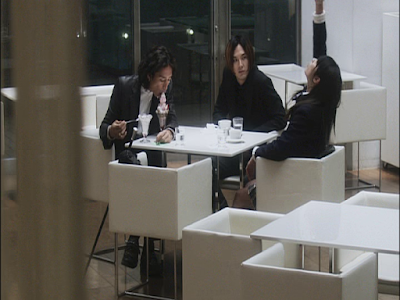 While the school tries to figure out the motive behind the girl’s action, a magazine writer by the name of Riku Nagase (Ryuhei Matsuda) reaches out to Anzu and her friends about the song, claiming it is a tune from an urban legend. The legend claims that anyone who sings it will kill themselves after it is sung. However, the true origin behind the song seems to be tied to Anzu’s past and she must now get to the bottom of it before her friends succumb to its power. I was incredibly disappointed with The Suicide Song. The concept of a song that would drive people to kill themselves after they sing it is sound (sorry for the pun). Having this concept take place in the world where karaoke is king should have resulted in, if anything else, an interesting horror film. However, this product goes a different direction and decides it wants to be something a little more than just a horror or a thriller…and that is only the beginning of the feature’s problems. Oh dear lord, those monsters dismembered Captain Atom! The Suicide Song tries to be a genre-bending product as it incorporates humor and social commentary into the story but it never truly felt like it succeeded at doing so. The humor comes in at awkward moments and I honestly didn’t find it funny and the commentary feels like it consists mostly of students and adults asking if bullying was involved in the initial girl’s suicide (seriously, you can have a drinking game with how often the phrase “Was there bullying?” is stated). There never feels like there is any more exploration beyond that. And that leads me to the next factor that wasn’t functioning in this film: Exploration and development. making mouth love to an ice cream sundae. have pop song groups in them. Wait, actually I'm not. This movie is hard to follow. While cultural barriers may play a very small role, the biggest problem I had with this film was just how messy the plot was and how uneven the story and character development was. First off, there are a ton of characters in this film because the school girls in the feature are portrayed by a Japanese all-girl pop group called AKB48. None of them have any real character or depth to them and the film really likes just jumping in and out of scenes involving them as a group. Matters are made worse when Riku and the magazine crew appear and they seem to grow with each passing minute of the film. By the end of the movie, there are a ton of characters and none of them feel developed or explored. It’s bad enough that none of their performances feel that really engaging or memorable (Matsuda just looks outright bored in his role) but the amount of characters undergoing nearly no development beyond the fact they survive the central conflict made the movie very hard to engage with. 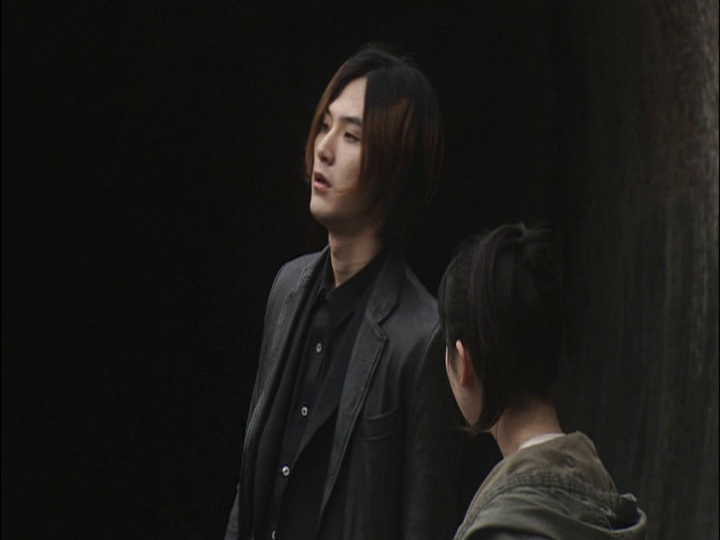 Matsuda literally looks this bored throughout the entire film. This lack of development and exploration is mirrored in how the plot is developed. There were literal moments where I would watch a scene and then that scene is described to another character and the description didn’t match what I saw. I started to wonder if the subtitles were incorrect but then I started to take into consideration how the entire movie just jumps wildly from moment to moment, never really developing anything and using dialogue as ways to somehow expand the narrative. Too often the characters are telling backstory and plot details and we are rarely seeing them in action (tell don’t show in action). Due to this, the song never truly feels like an urban legend and ends up feeling like it's some phenomenon that just began and, when you combine this with the film’s ridiculously low body count, it makes the whole “this song is gonna kill ya” plot point feel weak and never truly threatening, despite how the reporters keep talking like this is a long running problem. They didn't sing the song, they were just trying to get out of the boring damn movie. I really liked the concept to The Suicide Song but found the execution to be boring and a real chore to get through. 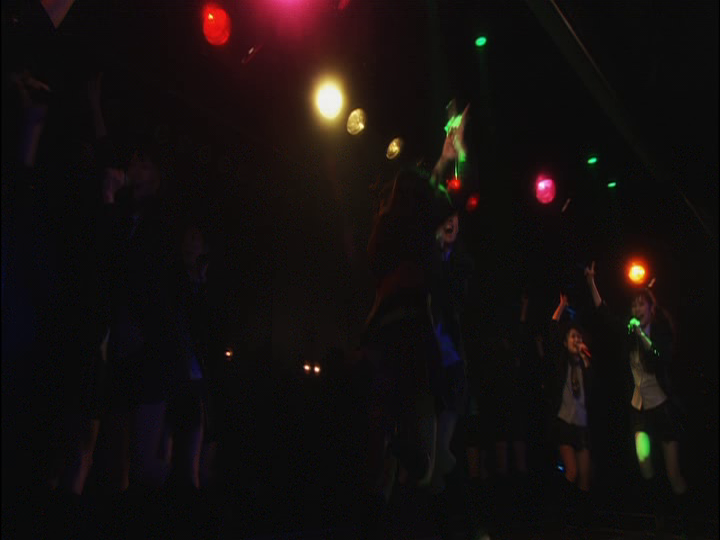 From a tone perspective, the film is all over the place and the conflicting tones never blend together. From an acting standpoint, the film is not very attention –grabbing and the plot and development is just terrible. There are also a big issue with the film’s obnoxious editing as it has constant, almost never ending, fast cuts that just felt unnecessary at best and absolutely distracting at worst. Overall, I really didn’t enjoy this film and, with all its problems, the over 2 hour running length was very hard to endure. I'm a geek, an atheist (who is also an ordained reverend), a peanut butter and jelly enthusiast, a man who shares the same name with a popular character from "Parks & Rec" and feels he can't live up to the awesomeness of the fictional character, was proudly banned from Reddit, an occasional Shakespearean performer, and a stand up comic. Have any questions, recommendations or wanna share any theories on various movies? Email me at RevRonMovies@gmail.com and I'll talk about them on my new Q&A segment!